Order now and be protected by DCOU Grinders "TRY-IT-OUT-AT-OUR-EXPENSE" customer SATISFACTION POLICY. Try our product and if you are not satisfied, simply contact us within 365 days and we'll refund your money. 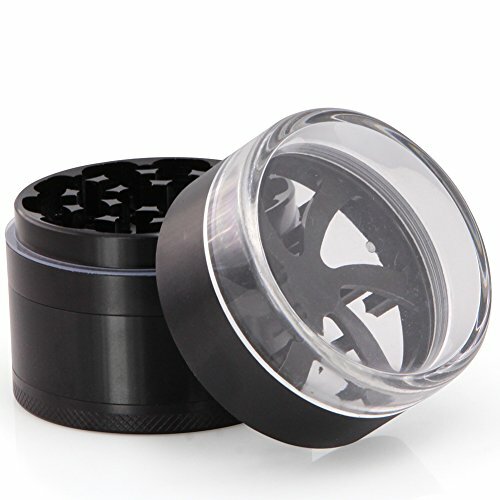 BEST QUALITY AND NEW DESIGN - This is the biggest and finest grinder model made with an acrylic window and clear top. Specially, the composition of this product is very harmonious with large 5 Piece set . Our unique design is not only a beautiful show piece but is extremely strong and durable grade, made by solid cnc machining, with neodymium magnets, and anodized color coating which is safer from scratches. QUALITY CRAFTSMANSHIP SO YOU CAN GRIND AT EASE - Looking for an indestructible grinder? Made from MILITARY GRADE aircraft aluminum, insert your herb, coffee beans, spice, or tobacco for a perfect grind every time. Between the powerful earth magnets and razor sharp diamond cutting teeth, pulverize loads of herbs effortlessly. EASY TO USE - The 5 piece design disassembles easily providing for easy use and cleaning.The magnet in the top of this grinder holds strong and makes things quick and easy. HEALTHY HERBACEOUS HERBS - What does that mean for you? All DCOU aluminum parts are chemically bathed and anodized, then closely inspected to eliminate any potential impurities. Our stainless steel pollen catcher is durable and easy to clean. Come with a beautiful and practical triangular crystal scraper. When it comes to health and safety, DCOU is a brand you can trust. 100% SATISFACTION GUARANTEE - DCOU guarantees all buyers 100% satisfaction, once you find any problem of the product please feel free to contact us, we will solve it as soon as we can. If you have any questions about this product by DCOU, contact us by completing and submitting the form below. If you are looking for a specif part number, please include it with your message.